You may know that Defra and Environment Agency have been involved with this year’s Geovation Challenge which the Secretary of State, Liz Truss MP, announced in her speech at the open environment launch. Geovation is all about promoting innovation in the use of geographic data, and giving technical and financial support to new business ideas that make use of data to solve problems. The challenge for this year was to come up with ideas on how we can better manage water sustainably. The five themes were: too little water; too much water; poor water quality; ageing infrastructure; and promoting sustainable behaviours. We have worked with Ordnance Survey (OS) and the other sponsors to identify these issues, review ideas submitted to the challenge, and ultimately help judge the ten most promising business solutions at the Geovation camp, held over 4–6 March. 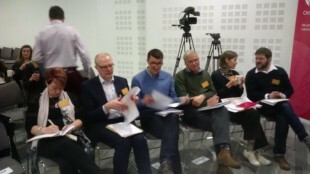 The Geovation Judges (minus EA's Mike Rose, who took the picture) deep in deliberation. I am second from the left. The ten finalists covered a diverse range of ideas – from an interactive sandpit overlaid with projected geographic visualisations to illustrate catchment issues, to ultraviolet detection equipment coupled with geographic tagging to map washing machines, plumbed into surface runoff drains rather than sewers. There were also ideas to map occurrence and type of plastic waste on beaches, and to set up a water issues portal to tap into new innovations from around the world. The Environment Agency's Mike Rose and I had the very interesting job of joining other judges from the water industry, academia and data sector to judge the finalists. This involved a trek down to Southampton on a sunny Mothering Sunday to join the camp – where the ten teams had spent the weekend developing their ideas with support from Geovation’s data developers. Based on the existing ‘Refill Bristol’, a plan to roll-out across the nation an app to pinpoint and endorse free tap water refill points at streets, cafes, retailers, hotels and businesses. This is to reduce the purchase of single use plastic bottles of water, and change the public mind-set of using disposable plastics that end up in our oceans. The app will capture data and reward and encourage behaviour change, by allowing users to build points to exchange for money-off vouchers, or other types of gamification. Very topical from the policy perspective, this idea will allow communities to employ sustainable catchment management, by identifying opportunities from geographic data to mitigate floods by “slowing the flow”. The team, who have catchment expertise and experience in building models, will make information available via subscription or one off reports. The team will use functionality similar to fixmystreet.com. Using a smartphone app, citizens will record instances of pollution, flooding, or overflowing drains, to let relevant authorities know so they can take action. Information will also be crowdsourced from interested groups such as walkers and freshwater anglers.